Norman E. Rosenthal is clinical professor of psychiatry at Georgetown University School of Medicine. He is best known for having discovered Seasonal Affective Disorder and how to treat it with light therapy. 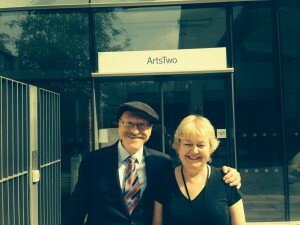 He recently visited the Centre for the History of Emotions to be interviewed by his friend, Professor Tilli Tansey, for her Wellcome Witnesses of Contemporary Medicine series (that’s them both on the right). During his visit, I got the chance to interview Norm about his love of Transcendental Meditation (TM), which he wrote about in his book Transcendence (2012). I’ve never practiced TM myself, but am interested in it as part of my research into ecstatic experiences in modern culture. 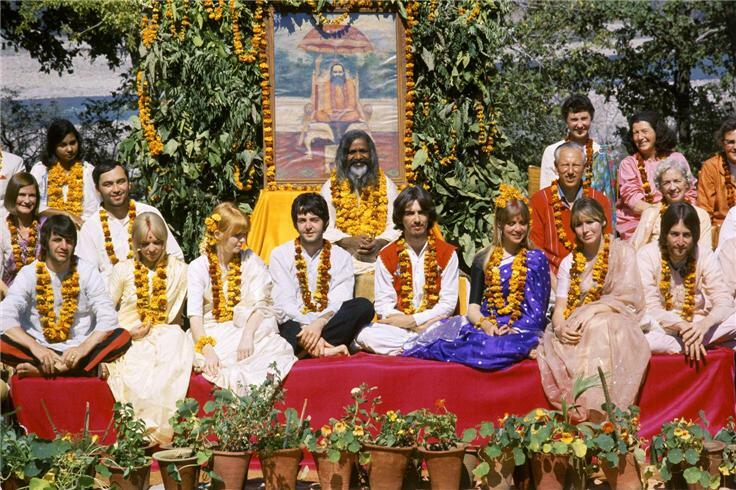 Ever since the Beatles went to India to learn how to meditate from the founder of TM, Maharishi Mahesh Yogi, it has attracted many western devotees, including Martin Scorcese, David Lynch, Oprah Winfrey, William Hague, and Russell Brand (who calls Norm ‘a cosmonaut of consciousness’). But is it more than just a celebrity fad? Does it have potential as a public health intervention? What exactly is ‘transcendence’? How has TM helped you, Norm? I’ve been doing TM for seven years. It’s helped me in a lot of ways. The first wave of help came in the form of stress reduction. I don’t sweat the small stuff as much as I used to. Things seem to go more easily – it’s like you’re swimming through the ocean of life with less friction. At the second level, the effects of the transcendental state of consciousness enter your daily life. At that point, various changes occur. There’s a tendency to be kinder to other people and to oneself. There’s a tendency to feel more connected to a larger universe, and less focused on one’s own ego. The fear of death diminishes, worries about things I can’t control are less. And sometimes there can be just great joy, without any real good reason for it. Little things seem more joyful. How does one practice TM? Traditionally, TM has been taught one-on-one, by people who are well trained. In that regard it’s different from mindfulness, where there is a sense you can learn it from a book. Here, it’s more like an Eastern tradition of a master passing down a technique to a student, like martial arts or other practices that are handed down. Then you get given your own mantra and you say it out loud? You’re given a mantra but you don’t say it repeatedly. You’re taught how to think it in a certain way. People who think the mantra has some magic significance – it may do or it may not, I don’t know – but the way we use the mantra in our minds, that’s something a seasoned teacher can teach you. Each of our minds work differently, and we might have impediments to using the mantra in the best way. That’s where a teacher can help you. Could you use any word as a mantra? It would have to be studied. The people who have brought TM to the West took it from an ancient tradition, where over thousands of years people developed certain words they found to be conducive to a soothing effect or a shifting consciousness. Whether another word would be just as good – that would have to be tested. As far as I’m concerned, I would rather use the words that have been used historically, and do it in the way that it’s been taught. I want to embrace the technique in its purest form as it’s evolved, because that’s the form most likely to produce the effects that I’m seeking. The words are from the Vedas? Yes, I believe so, they’re Vedic in origin. That makes me hesitant. I’d want to know what I’m invoking! Well, these words, as best as I can understand, don’t actually have a meaning per se. I’m not worried personally that I’m invoking some heathen God or strange spirit that’s going to trouble me. I see the word simply as that, a word. I know that some orthodox Jews have raised this question, but others have figured out a way of not letting it perturb them. The nice thing to me about TM is it doesn’t ask you to buy into any cosmology, any higher power. So to my mind, it would be theoretically compatible with any religion and with no religion. 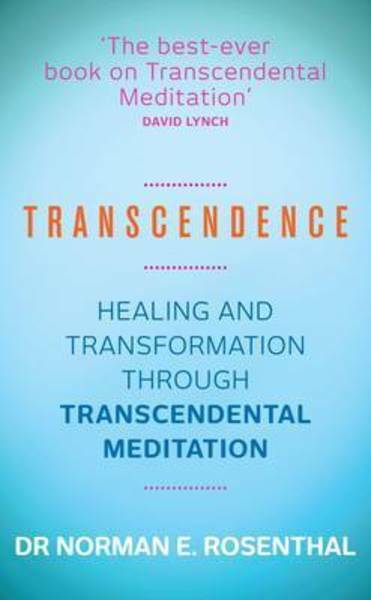 In your book, you often talk about people achieving ‘transcendence’ in meditation. What is this state? A problem with that question is that it implies transcendence is always one thing. It can be many different things. It could be going into some kind of space that you’re barely aware of and then emerging twenty minutes later, and if someone asked you what that experience was like you’d be hard pushed to describe it. Or it could be a state of consciousness where you are alert but very relaxed and restful, where you lose a sense of boundaries and space and time, and it’s very pleasant. That’s what a lot of us mean, but it can be very different things from session to session. Is there a risk in TM that ‘transcendence’ become a goal, which people become attached to? Your teacher will make it clear that this is not the goal, and if you set this goal, you’re unlikely to achieve it. 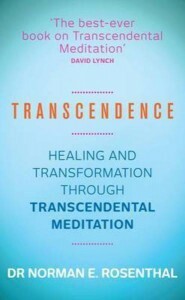 Because reading your book makes me want to achieve transcendence. The masters make it clear that you meditate to live, you don’t live to meditate. It’s the quality of your life you’re seeking to alter, not the quality of your consciousness. It’s nice if you have a pleasant experience, and reinforcing, and probably one of the things that makes transcendence work. But those who are steeped in the tradition will de-emphasize the consciousness-seeking aspects of it. In your book you mention research on how people used to sleep in two sleeps, in between which they sometimes experienced a moment of wakeful clarity, sometimes known as ‘The Watch’, which you compare to the transcendent meditative state. Yes, my colleague at the National Institute of Mental Health, Dr Thomas Wehr, carried out research on sleep in extended periods of darkness. Participants said their sleep was divided into two cycles, and in between they experienced a period of calm attentiveness, of crystal-clear consciousness. It wasn’t the sort of dysphoric description of insomnia that you often hear. It was a pleasant experience of restfulness that sounds very similar to TM. It could be that in TM we’re accessing that experience which we lost when we compressed our sleep into one cycle, with the advent of electric light. It could be like a missing nutrient in consciousness. What are some of the physical changes which TM practice leads to? There are some changes which occur in the actual meditation session itself, like slowing of the breathing, changes in the EEG, more alpha waves in the front of the brain, more brain-wave coherence. But probably of greater consequence are the long-term physiological changes, particularly the lowering of blood pressure. and how that plays out in terms of reduced risk of strokes and heart-attacks. Quite impressive statistics actually. Probably what’s happening is that, as you get upset throughout the day, you have spikes in your blood pressure. TM provides a sort of surge protector to these spikes. TM in some ways is a private organization, a trade marked technique which is not cheap, costing something like £400 – £600 to be trained in it [although there are some subsidies available apparently]. Does that limit its potential as a public health intervention? Firstly, it’s a not-for-profit. Its books are open for inspection. I don’t see anyone getting particularly wealthy from it. I understand their rationale for wanting to maintain quality control and not seeing the technique diluted by having it just out there. 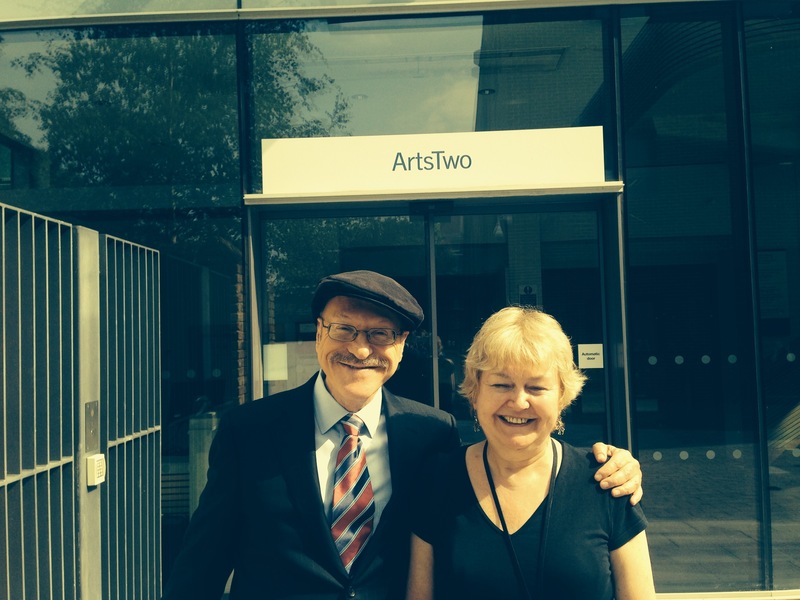 I’ve seen really wonderful results from experienced teachers sitting and working with individuals over time. I respect the decisions that they’ve made. I understand that these days when we get free information off the web, it could feel alien to pay for it. But it’s certainly worked for a lot of people I’ve seen. Professionals charge for their time and I have no problem with them doing that as well. There seems to be a rising interest in academia in ‘contemplative studies’, both in the sciences and the humanities. Is that something you’ve noticed? I haven’t tracked academic trends, but I certainly think it ought to be of great interest. When you have a technique that alters consciousness and which has huge physiological and medical impact, at a time when – to quote Wordsworth – ‘getting and spending we lay waste our powers’, there ought to be interest in it. A lot of the studies for TM come from the Maharishi University of Management in Vedic City. Could it have a confirmation bias? Yes, but a lot of those studies were funded by the National Institute of Health, published in peer-reviewed journals of the first order. Having been in academia for a long time myself, I’d say more or less everyone has a vested interest in confirming what they study. I wish there were more studies that are completely independent, that would be nice. In the UK, I believe a Maharishi free school has been started. What if a child didn’t want to study TM? Nobody is forcing anybody to go to that school. It’s a speciality school, which is likely to attract people who find the TM element interesting. In the Bay area of the US, there’s been something called the Quiet Time Programme – they were public schools. Children whose parents disagreed with it were perfectly at liberty not to participate. They did that Programme at some of the worst schools, with marked results. But no one should be forced to practice it. It’s not mainstream like reading and writing, and shouldn’t be required. 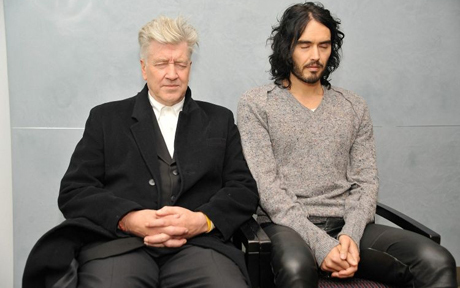 You interviewed some of my creative heroes – Martin Scorcese, David Lynch and others – who practice TM. I wonder if creativity sometimes comes from dark and unresolved places in us. Could TM be bad for creativity? I’ve heard David Lynch respond to that question many times. He says there’s a myth of the artist suffering alone in his garret, and that’s a myth mainly used by French men to get girls. If you’re suffering and emotionally unwell you’re less likely to create something than if you’re well. That doesn’t mean you haven’t visited some dark places, but if you’re in the middle of the Dark Night of the Soul, you’re less likely to create than if you’re in a better place. Are there any side-effects to TM? There are side-effects to pretty much anything. Some people get side-effects from drinking too much water. And some people might get side-effects from TM, like it might disturb your sleep at the beginning. But on the whole it’s very safe. Has TM changed your view of religion or spirituality? I would say that it’s made me more spiritual. The issue of a higher power or life after death are not issues that concern me very much. But the issue of belonging to something greater than myself is a nice concept that I feel greater kinship with than I did previously. I came away from reading Norm’s book sold on the mental and physiological effects of the ‘technique’, but unsure whether one really could chant a holy word from the Vedas for 40 minutes each day if one was, say, a Christian or Muslim or indeed a secular humanist. Perhaps Christians should practice the ‘hesychast‘ technique instead – it’s an ancient Orthodox practice which involves the daily chanting of the Jesus Prayer. But there aren’t many practitioners of it in the west who could guide learners – there are some in the World Community of Christian Meditation. A Christian would probably baulk at the instrumentalization of prayer for health benefits. On the other hand, a TM devotee might say the real aim of TM is the spiritual transformation of one’s self and society, and the health benefits are just a canny way to ‘sell it’ to a skeptical and secular audience. And is the desire for transcendence necessarily selfish? Some Christian mystics – such as the 17th century English mystic Thomas Traherne – would say experiencing the bliss of one’s deep consciousness is an essential part of finding God within and turning away from our addiction to the senses. Some of the TM movement’s claims, like the claim that if 1% of the global population practiced TM, war would cease, seem to me over-optimistic (though no doubt the world would be somewhat improved). 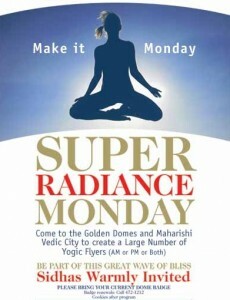 Maharishi tried to gather 2000 ‘pandits’ to chant continuously for this aim, and his organization is still trying: there are reports that Vedic City in Iowa (the global headquarters of TM) is now importing Indians and paying them $200 a month to live in a compound and chant continuously until the ‘Super Radiance effect’ takes place and world peace is automatically achieved. Yes, even global transcendence can be out-sourced to cheap Indian labour these days! On the other hand, Jesus said you can tell the tree by its fruits – Norm himself seems a very warm, kind person, who believes he’s been greatly helped by TM, as do other credible people. And the various NIH trials of TM also seem to show genuine physiological and emotional benefits (even though, ultimately, I wouldn’t want to meditate just to lower my blood pressure). I am curious, finally, as to what conclusions we can draw about the self and nature from deep meditative practices like TM. What does it mean if, when we sit quietly and let our mind be still, we discover a place of joy and light within us? What does that say about the mind, and what does it say about the nature which created it? Norm’s latest book, by the way, is The Gift of Adversity: The Unexpected Benefits of LIfe’s Difficulties, Setbacks and Imperfections. This entry was posted in Emotions and Psychiatry, Interviews and tagged Norman Rosenthal, SAD, Seasonal Affective Disorder, Transcendence by Jules Evans. Bookmark the permalink.